New single by sonorous Afro Soul singer Treasure Crown titled "Light on Us", a supplication that spurs from worship. Treasure Crown uses lyrics with spiritual intelligibility to help listeners pray rightly by laying their supplication through worship. What better way to worship if not through a soul lifting melody. Over the years, Treasure Crown has stood out amongst her contemporaries. churning out "Good News Music' and uplifting those in despair. TC (as fondly called) hails from Eastern Nigeria and is a member of the Imo State Government House Band. She has also enjoyed recognition from Gov. Rochas Okorocha in 2012, 2015, 2016 and those endorsements have opened up windows of opportunities to minister amongst the elites and dignitaries. 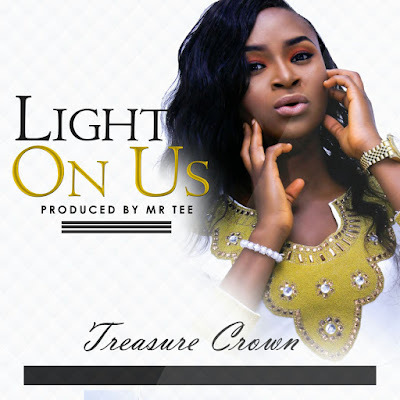 "Light On Us" produced by Mr Tee will definitely speak to you!